“The word cancer has such a chilling effect on people, me included, but I’ve learned over the past few weeks that this illness doesn’t have to be elevated to some uber-powerful status. It’s simply an illness that the NHS treat with expertise and care,” she says in the video. 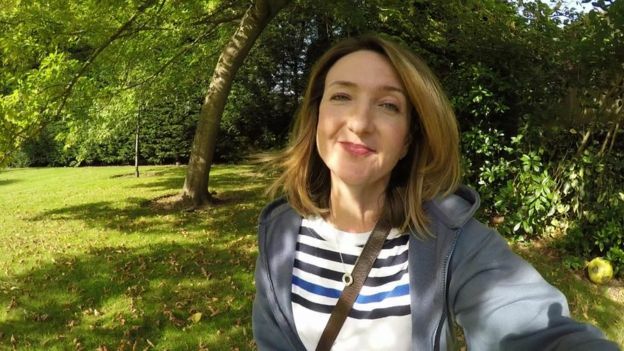 Derbyshire, 47, was diagnosed with lobular breast cancer, which means it develops in the lobes of the breast and spreads to surrounding tissue – some 10% of breast cancers are this type. She had a mastectomy on 24 September at Ashford Hospital in Surrey, part of the Ashford and St Peter’s Hospitals NHS Foundation Trust. “Today I had a mastectomy. I feel all right, I can’t believe it,” she says in her hospital bed, just hours after the operation. “When I woke up from the anaesthetic I did cry. It was just relief, such a relief. The malignant tumour in my right breast is gone, two or three lymph nodes are gone,” she explains. Derbyshire praises the treatment she has received from NHS staff, describing it as “awesome”. “They are so inspiring and caring and I feel so grateful to them,” she adds. She says she’s in some pain, but not much, as it’s being controlled by painkillers. “It feels like someone has punched me in the right-hand side, but it’s not the end of the world, it’s really not. Watch Victoria’s diary in full here. Breast cancer is the most common cancer in the UK – one in eight women will be diagnosed with it. It’s the second most common cause of death from cancer in women in the UK. “Everyone who’s diagnosed with cancer, I’ve learned, has a different story, a different experience and a different way of approaching it. I, for what it’s worth, don’t feel like I’m battling cancer, I don’t feel that I’m fighting cancer, I am simply being treated for cancer,” she explains. “The reason why I wanted to talk about what happened to me is because I’m a pretty open person, but also because more than one in three people will be diagnosed with cancer at some point in their lifetime and here’s the thing – having cancer is manageable, it can be manageable. Having a mastectomy is totally doable. I didn’t know those things until I got cancer. And that’s what I want to tell people. Derbyshire left hospital the day after the operation, and, in an update recorded five days later in the park with her puppy Gracie, she says she’s not in very much pain unless she accidentally pulls herself sharply. “I’m restricted in my movement – I’m up and about, I can walk, but I can’t really use my right-hand side. I couldn’t lift a book, or a laptop, I can’t hold a shower head to wash my hair or use my right hand to brush my teeth, so that’s slightly frustrating but it’s not the end of the world,” she explains. After receiving results from the tissue removed from her during the operation, Derbyshire has been told she needs radiotherapy and chemotherapy. She will have it in the coming months and will present her programme as much as she can during her treatment. She’s next back on air on 20 October. “I’m not worried about that as the cancer is out of me, it’s gone. That’s just the next part of the treatment, the next part of the process. And in this whole process I haven’t actually felt ill once, and it’s bizarre,” she says. This entry was posted in Cancer, Cryoablation, Kidney Cancer, Magnetic resonance imaging, Surgery, Tumour and tagged Breast cancer, GL-W, Greg Lance-Watkins, Greg_L-W, Mastectomy Diary, Pertuzumab, Victoria Derbyshire. Bookmark the permalink.